You MUST have tried to solve your issue first before completing this form. This form is for those who have a non-working Sky Muster install. Plug a computer directly into the NBN modem, bypassing the router. If it still isn’t working, please contact your provider and contact nbn – 1800 OUR NBN or via their FB page or email: info@nbn.com.au. Please complete this form if you still have no working connection after completing the above. 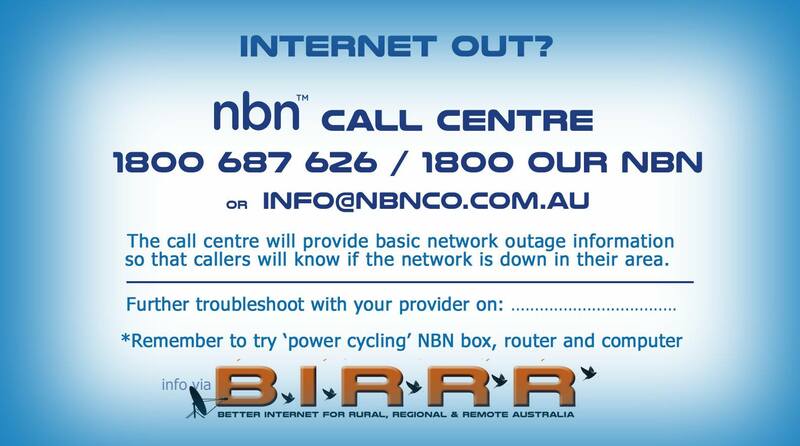 BIRRR will do their best to help troubleshoot the issue and send your information onto provider & nbn contacts. Click here for the form. This form is for Non-NBN Fixed Wireless ISP’s to enter your wireless towers onto the BIRRR map. You can view the map here. Please enter all of your covered areas into this form, one area/town/tower at a time. (1 response per town/tower). It will then appear on our map within a few minutes. 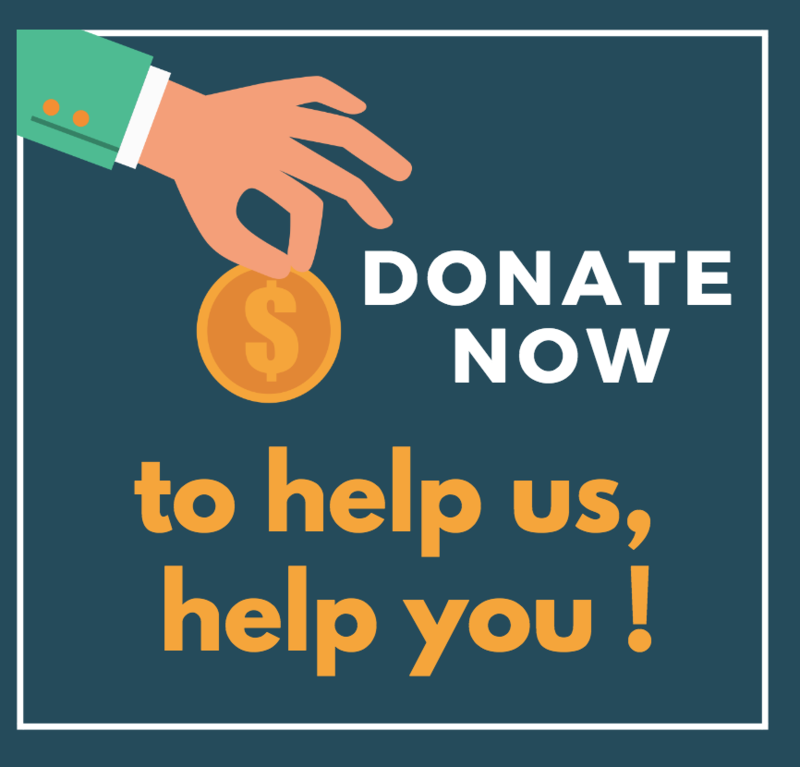 Click here for the form. If your business offers Internet , point to point systems or ICT products or services that may be of interest to Regional, Rural and Remote Australians, please fill out this form to have your details added to the map on our website. More details here including the map. Rural Australians have the chance to influence the future of telecommunications in the bush, through a new survey being hosted by BIRRR (Better Internet for Rural, Regional and Remote Australia). “We urge everyone in the bush to get online and fill out this questionnaire – help us build a clear profile of which tools are most important to keep us safe and connected,” said BIRRR spokesperson Kristy Sparrow. The survey takes just ten minutes, and explores the telephone and internet options in homes. The Australian Government is currently developing options for a new Universal Service Guarantee (USG) which seeks to ensure all Australians can access voice and broadband services. “This USG is so vital for rural, regional and remote Australia – if they get this wrong, we have grave concerns that some could well be left in very tough and isolated situations, with potentially disastrous consequences.” “Data we collect will be provided directly to the USG taskforce committee, government departments and ministers and will be used in BIRRR work towards better bush communication,” Kristy said. many rural residents have a landline only, no internet connection. Many Sky Muster users (42%) have no mobile coverage. Boosting coverage into your home is costly. Illegal repeaters are causing huge issues with mobile coverage. Voip (considered a replacement for landline) is not simple to use and is not reliable. 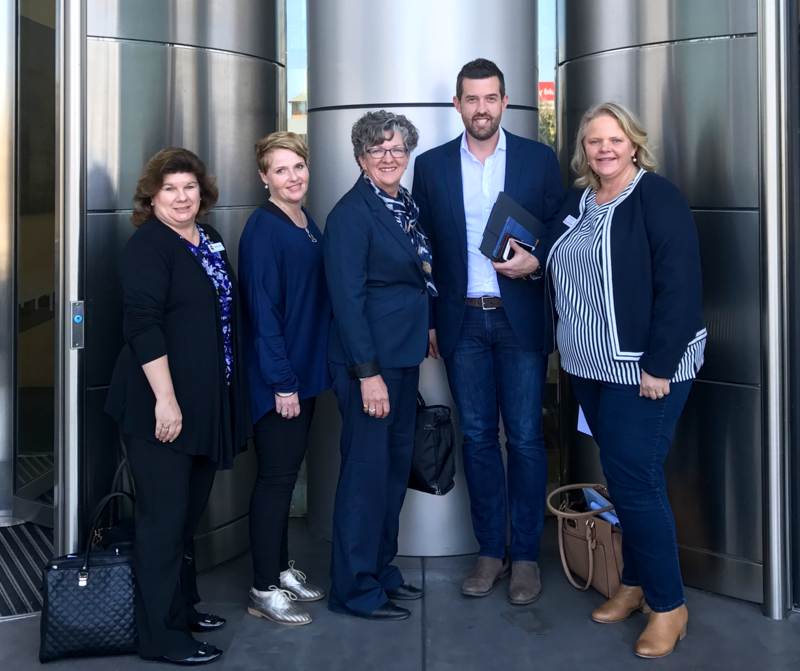 BIRRR has been involved in previous submissions to government in their ongoing effort to save existing tools and to secure RRR telecommunication services into the future. 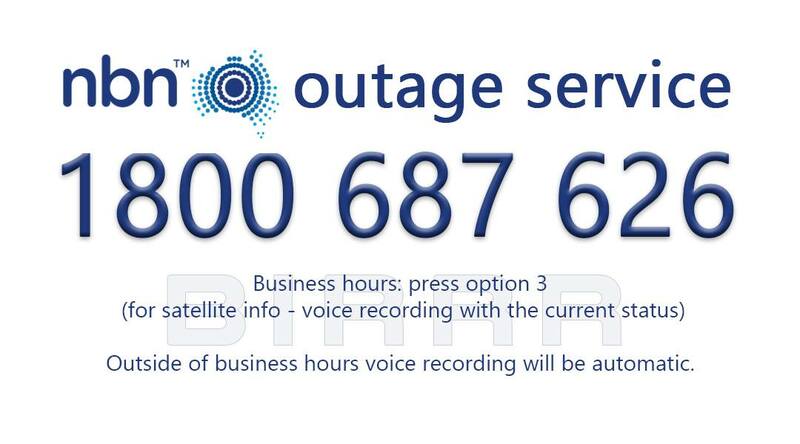 VoWIFI or WIFI Calling is currently supported by the Telstra*, Optus and Vodafone networks. It allows you to make and receive calls with a compatible mobile phone using your home internet (you don’t need mobile coverage). To turn WIFI Calling on for an iPhone, go to Settings, Phone, and switch the toggle to WiFi calling on. You may have to update Carrier Settings for this feature to be visible. What is VoWIFI or WIFI calling? VoWIFI enables voice calls (incoming and outgoing), MMS** and SMS** over a WiFi network. VoWIFI is available if you have a compatible plan, a compatible device, you are connected to a supported^ WiFi network and your mobile network coverage is poor or non-existent. * For Telstra customers, VoWIFI traffic (data) is not charged to your Telstra internet account. ^ Almost any home or business WIFI network will support VoWIFI. It is important that the WIFI signal is strong, so keep the phone relatively close to your WIFI router. The quality of your internet connection must be sufficient to support VoWIFI calls. There are four key pre-requisites for VoWIFI. Your phone must support VoLTE or Voice over LTE. This technology enables voice calls over 4G networks. Until recently voice calls were carried over the 3G network and prior to that over the 2G network. VoLTE delivers some great improvements to voice calling. You can experience faster call connection times compared to 3G and you may talk and browse at the same time. VoLTE voice calls are high definition (HD) for sharp, clear call quality. See the carrier links below for details on enabling the VoLTE feature. With the exception of approved Apple smart phones, your approved mobile phone must be supplied by Optus for the Optus WIFI calling service and Telstra for the Telstra VoWIFI service. See the Carrier links below for details on enabling the VoWIFI feature. Mobile Phones supporting VoWIFI are currently limited, but slowly expanding (see details of approved phones below). You must ensure that the latest software is loaded on your mobile phone. What is the Cost? There are no additional mobile network charges for WiFi Calling. Your calls and messages will be charged as per the rates of your existing mobile plan. VoWIFI (WIFI calling) voice calls use approximately 3.8MB of internet data for a 5 minute call. iPhone X, iPhone X plus, iPhone 8, iPhone 8 plusiPhone 7, iPhone 7 Plus, iPhone 6, iPhone 6 Plus, iPhone 6s, iPhone 6s Plus, iPhone SE. Currently, it’s only available to customers on a postpaid mobile plan with selected Wi-Fi Calling compatible devices. Tip – Be close to your router, turn airplane mode on if you have some small amount of mobile coverage. *Please note, while all care has been taken in compiling BIRRR documents, we recommend that you check with your provider regarding WIFI Calling. Thanks to BIRRR member John Kitchener for compiling this document. The company responsible for building the National Broadband Network, nbn, has released its test agreement with Qantas allowing them to test a “Proof-of-Concept Aeronautical Mobile Satellite Service” on a Qantas test aircraft. The proof-of-concept test is expected to help guide the development of nbn’s Satellite Mobility Product expected to launch in the third quarter of 2017. As part of the trial, the network speed will be limited to 20 megabits per second for each aircraft on at most two aircrafts concurrently. The connection will also be limited to agreed flight corridors. Detailed analysis: How will Qantas’ on-board Wi-Fi impact NBN satellites? With under 350 flights spread out geographically and over a 24 hour period, I doubt the planes would have a material effect on congestion. Currently, the worst case scenario seems to be up 6-7 planes flying under a single beam at any given time. However, in the case of the 7-plane statistic, it happens only once in a 24 hour period. The speed at which planes travel also mean that they will typically fly in and out of narrow beams within 10-15 minutes, meaning any impact should be distributed across multiple beams as the plane flies through the airspace. 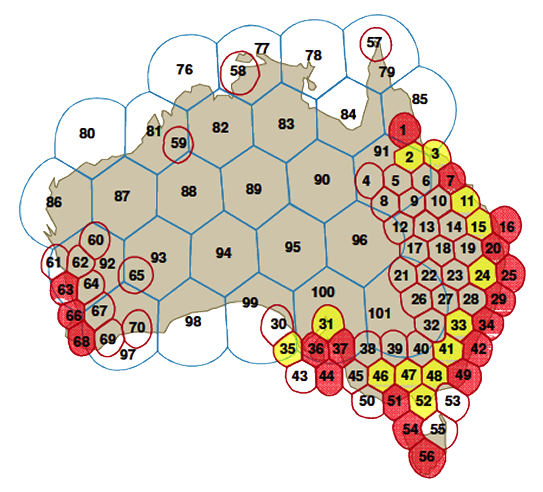 Diagram showing NBN Co satellite beams and risk of congestion as determined in the Fixed Wireless/Satellite Strategic Review (FWSat SR). Senator URQUHART: I know that there have been some discussions around the use of the Sky Muster satellite data on Qantas aircraft. What percentage of the overall data will be allocated under that agreement that you have got with Qantas? Mr Morrow : It is not an allocation of data that we would offer for aviation-based services. It is only the use of idle capacity when it is sitting there not being used at all. Our intent is that the priority services are for the ground-based homes and businesses that are targeted with satellite. If they are using all the capacity and a plane flies through that beam, the plane does not get any sort of internet connectivity. 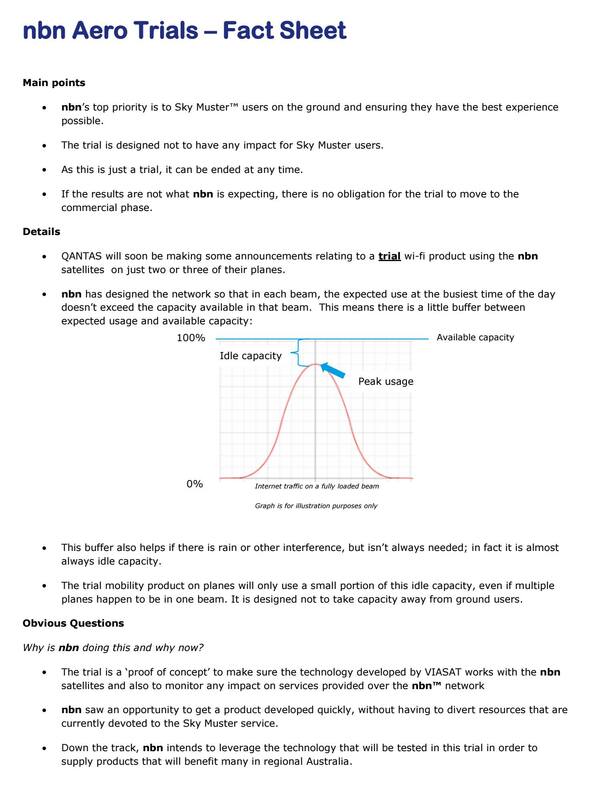 If, however, there is available and idle capacity, the plane can download or upload, depending. Mr Morrow : We did change the second satellite to give it a considerable amount more of capacity than it had had before – almost double the capacity. So we have repurposed the second satellite for additional capacity. The death of in-flight entertainment? American Airlines scraps screens and tells fliers to bring their own. The world’s largest carrier said it decided to ditch seat-back monitors on its new Boeing 737 Max aircraft – intended for domestic routes in the US – because most passengers travel with mobile phones, laptops and tablets. Instead of investing in screens it will upgrade in-flight internet speed, to ensure passengers can browse the web and stream movies quickly. The service uses NBN’s Sky Muster satellites, and the carrier says it’ll be around 10 times faster than inflight Wi-Fi already in place on other domestic airlines around the globe like Delta in the US. The full fleet of 80 Qantas 737s and A330s will get in-flight Wi-Fi some time throughout 2018. Qantas expects around 50 per cent of passengers to be using its inflight Wi-Fi and internet service during regular flights. Here are details from the 9 major US airlines that offer wifi. (This list is specific to domestic flights; if you’re flying internationally, the check-the-website rule applies even more fiercely because international fleets carry different gear than domestic fleets. If an airline has good in-flight wifi on domestic routes, though, they’re probably good for international routes as well.) Three things were taken into account when making this list: the likelihood that your plane would actually have wifi; the type of equipment powering the wifi; and its relative dependability, speed, and value. Check here to see how to make the changes. Until now, BIRRR has spent considerable time troubleshooting nbn issues – we now ask that these issues are directed to NBN or your provider. It doesn’t mean we don’t care, or can’t help if you continue having issues after you have tried these alternate contacts. NBN now has a new ‘specialised regional support team’ inside the existing nbn contact centre which customers can call directly, dealing with a wide range of issues. 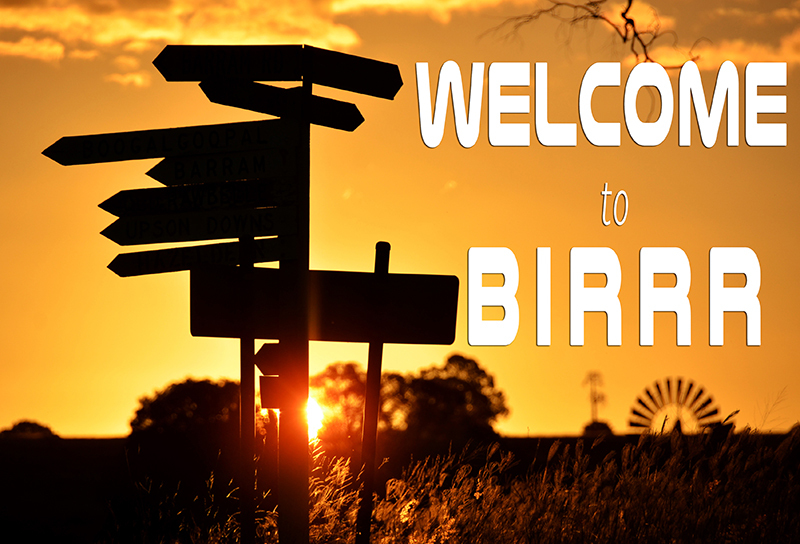 BIRRR welcomes this improvement, as we have consistently called for this contact centre to be created. We also appreciate that NBN has acknowledged the work the BIRRR team has done up until now. We are looking forward to spending more of our time advocating for RRR communication needs, rather than troubleshooting. BIRRR encourages providers to follow NBNs lead and establish their own specific RRR contact centres. Not sure what type of NBN connection you can get? Visit here and type in your address (you may have to drag the marker over your house). NB: the nbn co call centre will not be able to help with tower/nbn activation dates, nor will the BIRRR team. The ‘nbn co check your address’ site has a date of service available. Cancelled/Postponed installations? Contact NBN and report your problem! NBN have set up new procedures and are trying to be more helpful. Installer fails an install?If you feel that they could have tried harder (different locations on your property, tried a 3m mast etc) Contact NBN. Equipment is installed, but not working. Try the power cycle routine (see here). Try the different ports on your NBN box, power cycle in between swaps. If still not working contact your service provider (RSP). Make sure you get a ticket number. If you don’t have a working connection, please try a power cycle routine once with a computer plugged directly into the NBN modem. See here to see how to do a power cycle correctly (the article is about SkyMuster, but the principle is the same). If you have a SkyMuster connection check here for further details. If you are still offline check the service status pages offered by SkyMesh who lists unplanned outages here, and Iinet who list scheduled maintenance events here, to make sure your problem is not a widespread problem. Activ8me Facebook page and the ANT Facebook page also list outages when they know about them. If you are offline and it is not a widespread problem, please contact your RSP (service provider), make sure you get a ticket number. Send an email (if you can) to your RSP support about the problem, so they know it exists, especially if the callback queues are long (if the queues are long, it means that many customers have a problem). Contact your service provider (RSP) when you have problems with your speed, dropouts, excessive data usage. call centre policy and protocols have changed so that satellite end users will not be referred immediately to their RSP. ‘By now you have no doubt heard about Sky Muster, nbn’s $1.8 billion custom-built broadband satellite delivering fast internet to the bush. While nbn has heard many stories of people having a great Sky Muster experience, we have also heard your concerns. These concerns are something nbn takes very seriously and the company wants to directly address them here. 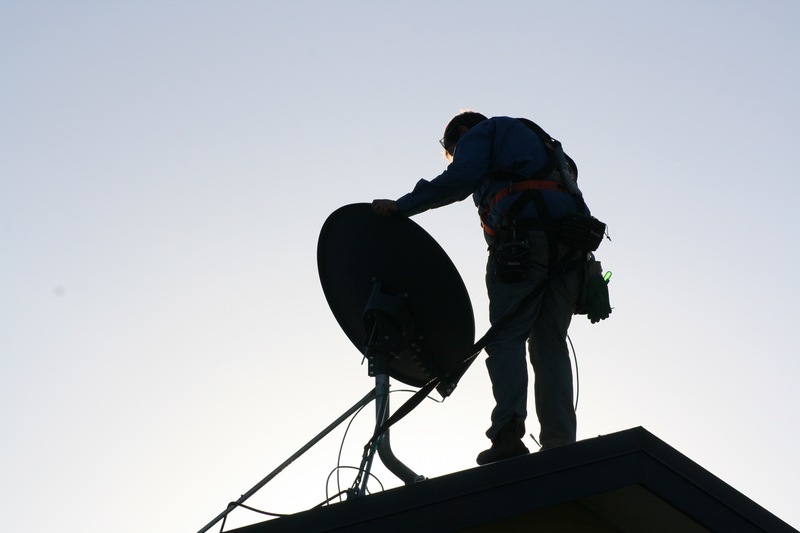 nbn is currently implementing a satellite service improvement programme, which is being led by a committed task force to address and resolve the issues identified. Some of the corrective action already undertaken includes software fixes to reduce connection times and configuration updates to improve the stability of the service. This work is ongoing and has seen a substantial improvement in network stability. nbn has implemented changes to our call centre and social media processes which means we are now providing network information directly to end users as it becomes available. We have also set up a dedicated regional support team in our call centre to handle regional-specific queries. In addition, nbn is working with our retail providers and delivery partners to help improve the installation process and ensure the number of rescheduled and missed appointments is minimised. The Sky Muster technology is breaking new ground and as with any new technology, particularly one as complex as satellite broadband, there are issues early in the roll-out that need to be worked through.